Please click here for a Data Sheet (PDF format). If you are an existing customer, and would like to purchase more probes, you can email us at [email protected], or reach us at (805) 730-3310. The ThermaLever™ probes are batch fabricated thermal probes composed of doped silicon. These probes have a heater integrated into the end of the cantilever which allows them to be heated in a controlled fashion to around 400˚ C at very rapid heating rates. These characteristics distinguish them from previous commercially available thermal probes which typically either require some manual fabrication or can only be heated to low temperatures due to the resistor being fabricated from thin metal films. Another significant advance with these probes is the end radius of the tip. In previous styles of thermal probes the tip radius is significantly larger than standard AFM probes. This is not true with the ThermaLever probes which provide lateral resolution in imaging very similar to other AFM probes. 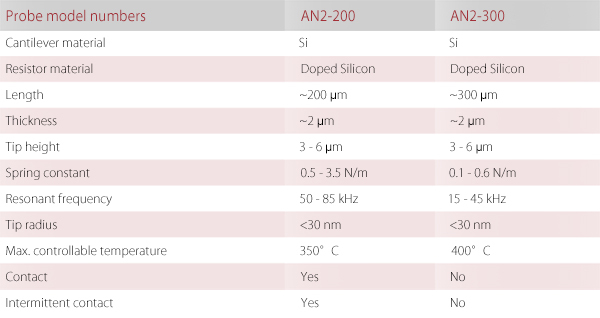 Anasys Instruments has two models of ThermaLever probes available, the AN2-200 and AN2-300. Both these probe models have a tip height ranging from 3 to 6 microns and have a cantilever thickness of around 2 microns . The AN2-300 have lower spring constants and are designed for contact mode operation while the AN2-200 have high enough resonant frequencies to be used in intermittent contact mode. Shown below are SEM images of the AN probe, showing the entire cantilever (left) and a close-up of the tip (right). 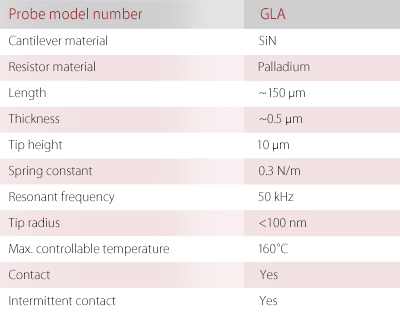 Following is a list of the specifications for the two different models of thermal probes. The SThM probes are designed to allow measurements of the temperature of the apex of the probe so that they can be used to image variations in thermal conductivity or temperature on the surface of a sample. They are batch fabricated probes which provide better than 100 nm resolution for both the topography and thermal images. The cantilever is made of SiN with a thin metal wire deposited so that the highest resistance portion of the wire is near the apex of the tip. Due to the use of the metal film resistor they cannot achieve the high maximum temperatures like the ThermaLever probes. These tips are premounted on supports and electrically connected for minimal handling and ease of use. Shown below are SEM images of the GLA probe, showing the entire cantilever (left) and a close-up of the tip (right). Also see Heated (HT AFM) Tips.